One of our leaders took on a big challenge in aid of Girlguiding UK. One of our leaders, Rebecca Harding, tells us about the challenge she set herself in the name of Girlguiding. “In December 2016 I decided to challenge myself and signed up to take part in the Girlguiding UK Charity Trek of the Great Wall of China. As a Brownie leader I challenge Brownies each week to try new things and at 6th Whitchurch Brownies we are not allowed to say we can’t do something! So this was a challenge for me and throughout the challenge I was not allowed to say ‘I can’t do it’ – our Charity Trek group t-shirts said it all – ‘Girls can do anything’. 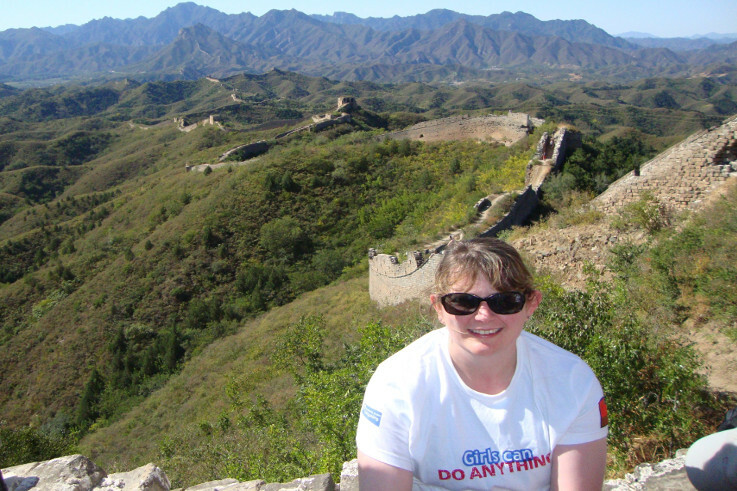 I first saw the challenge on the Girlguiding website, the iconic image of the Great Wall stood out and made me think I would love to go; traveling independently I knew going with Girlguiding I would be looked after and have fun. I signed up and told my family over Christmas dinner that I was going to China in 2017. I have been fundraising and training for the challenge throughout 2017 finding beautiful walks around Shropshire, Cheshire and North Wales borders as well as climbing lots of steps. The Girlguiding Charity Challenge co-coordinator at HQ has been very supportive and she also completed the challenge with us. Over ten days at the end of September thirty ladies took part in the challenge, the majority of whom are members of Girlguiding but the charity challenges are open to anyone to raise money for Girlguiding UK. Some of the group flew out to China the week before the trek and had an extension trip to see the Terracotta Warriors; I joined the second group traveling to China for the trek. The trek was organised by Discover Adventures and we were joined by two guides from Discover Adventure, a doctor and two local Chinese guides. We spent 6 days walking along different sections of the Great Wall of China – this included walking on parts of the original wall, wall that had been restored, walking on / by un-restored wall. The weather was kind to us and we had breathtaking views of China. The walks were challenging with lots of steps and slopes to climb up and down. Each night we stayed in different hotels close to the section of wall we would be climbing the next day. All of the ladies successfully completed the challenge and have raised £45,000 at present for Girlguiding UK – this money will be used for new unit grants, grants for units in deprived areas, training for Peer Educators, paying for members to travel and speak at high profile events to influence decision making and supporting members with disabilities.